New research by Brown University geochemists provides new insights on the scale at which Earth’s mantle varies in chemical composition. The findings could help scientists better understand the mixing process of mantle convection, the slow churning that drives the movement of Earth’s tectonic plates. The research, which Liu co-authored with Yan Liang, a professor in Brown’s Department of Earth Environmental and Planetary Sciences, is published in Science Advances. Earth’s crust is on a constantly moving conveyer belt driven by the convecting mantle. At mid-ocean ridges, the boundaries on the ocean floor where tectonic plates are pulling away from each other, new crust is created by eruption of magmas formed by the rising of the mantle materials from depth. At subductions zones, where one tectonic plate slides beneath another, old crust material, weathered by processes on the surface, is pushed back down into the mantle. This recycling can create mantle materials of different or “enriched” compositions, which geochemists refer to as “heterogeneities.” What happens to that enriched material once it’s recycled isn’t fully understood. Scientists learn about the composition of the mantle by studying mid-ocean ridge basalts (MORBs), rocks formed by the solidification of magmas erupted on the seafloor. Like fingerprints, isotope compositions of MORBs can be used to trace the mantle source from which they were derived. Another type of seafloor rock called abyssal peridotites is the leftover mantle after the formation of MORBs. These are chunks of mantle rock that once were the uppermost mantle and later uplifted to the seafloor. Abyssal peridotites have a different isotope composition than MORBs that appear to come from the same mantle region. To explain that difference in isotope compositions, scientists have concluded that the MORBs are capturing the isotope signal from pockets of enriched material—the remnants of subducted crust preserved in the mantle. The question this new study sought to answer is how large those enriched pockets would need to be for their isotope signature to survive the trip to the surface. As magma rises toward the surface, it interacts with the ambient mantle, which would tend to dampen the signal of enriched material in the melt. 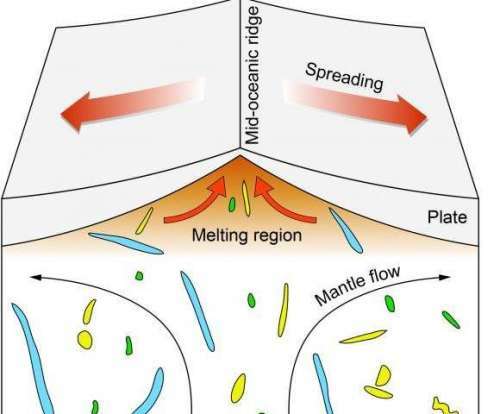 For their study, Liu and Liang modeled the melting and magma transport processes. They found that in order to produce the different isotope signals between MORBs and abyssal peridotites, the pockets of enriched material at depth would need to be at least one kilometer in size. The researchers hope their study will add a new perspective to the fine-scale structure of the mantle produced by mantle convection.